Anton Chekhov, a subtle conjuror of mood who could tell in the story of an individual the reality of millions, once said, “Knowledge is of no value unless you put it into practice.” Return to Putin’s Russia, a collection of articles written by esteemed Russian scholars and edited by Stephen K. Wegren, displays an impressive breadth of knowledge; however, it lacks practicality beyond the lecture hall or faculty library. Taken individually, there is no doubt that the articles, which range from “The Role of Law” to “Relations with the European Union,” display the impressive understanding of academics let loose in their field of expertise. Yet one can read the book from cover to cover and still feel no better acquainted with current Russian trends. This begs the question, is this collection really as analytical as it claims to be? As a whole, I would argue not, though the truth is that it really depends on the article. Some sections are inherently more statistical, and justifiably so. For example, in the study of demographics entitled “Population Trends” by Timothy Heleniak, the data is telling in itself; however, these sections can slip into numbingly factual-numerical storytelling, as is the case in, for instance, “Agriculture” by the editor. Also, given that we’re talking about a nation whose Bolshevism was underscored by the artwork of El Lissitsky and Rodchenko and whose communist edifices were undermined by Solzhenitsyn, it seems bizarre that in a study of Russian politics there could be no section dedicated to the role of Russian culture. Can Russia’s political life really be analyzed without a study of its historically symptomatic culture? Similarly, health and education are areas of Russian life the anthology would have done well not to overlook. 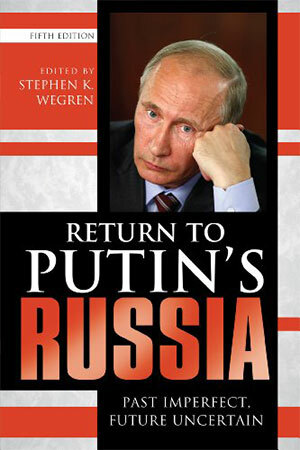 Nevertheless, it’s clear that the book’s intent is to be a point of reference for students of international relations or similar courses, and it certainly serves its purpose in providing factual documentation and a structural understanding of the Russian state during the Medvedev years and Putin’s first two terms. Indeed when the aim of a section is clearly elucidated in the introduction, the facts become useful aids to at times insightful prose. Such is the case in “Civil Society and Protest” by Alfred B. Evans Jr. and “Is Military Reform Over?” by Dale R. Herspring. The former refreshingly and convincingly argues a clear point: that protests in Russia since 2005 have inherited the legacy of the anti-monetization movement of that year. The latter disassembles the complexities of the military into thematic, manageable chunks in order to answer the question posed by the essay’s title. Both have a definable structure and benefit greatly from their aim, something which is too often lacking in other sections of the book. Perhaps the most incisive observations, however, come from Richard Sakwa, whose article “Political Leadership” opens the collection. He adopts Ernst Fraenkel’s analysis of the 1930’s German power structure consisting of a “prerogative state” and a “normative state,” and applies it to present-day Russia, contrasting the constitutional state and the administrative regime. He believes that there is a duality to Russian politics—that the “Byzantine world of informal groups, factions, operating within the framework of the inner court of the presidency” is hidden behind a thin veneer of democracy and legality. It is an interesting comparison, especially now, when Russian tentacles are probing Eastern Europe, echoing the years of appeasement. Overall the book is a creditable study of Russia; however, its cover copy describes it as analysis, and in this capacity, it falls short. It is too impersonal and too distanced from its subject; it lacks Chekhovian detail. The book is designed to live in a library, not a home, and is most useful as a reference to be dipped into, rather than read cover to cover. Doing so often reveals overlaps and reiterations between sections, which vary greatly in perspicacity. Rowman & Littlefield Publishers; Fifth Edition, 2012. 340 pages.